This charred ramp pesto recipe is easy to make in a food processor. It takes five minutes to blend and will last for months in the freezer. I love foraging wild edible plants in the spring and ramps are one of my favourite. Scientists call them allium tricoccum. In North America they’re also known as wild leeks or wild garlic. And around the world they are often called wild spring onions, ramson or wood leeks. Whatever you call them, these wild plants are a delicious start to spring. Although I don’t look forward to cleaning the ramp bulbs and leaves. They can have so much dirt that a 20 pound haul of ramps is only 14 pounds once cleaned. Yes you really can forage six pounds of dirt with us but I guess that’s tough part of the foraging process. The fun part is deciding what to make with it and I love charred ramp pesto. Most people are familiar with pesto Genovese, a traditional Italian condiment using basil from Genoa a city in northern Italy. 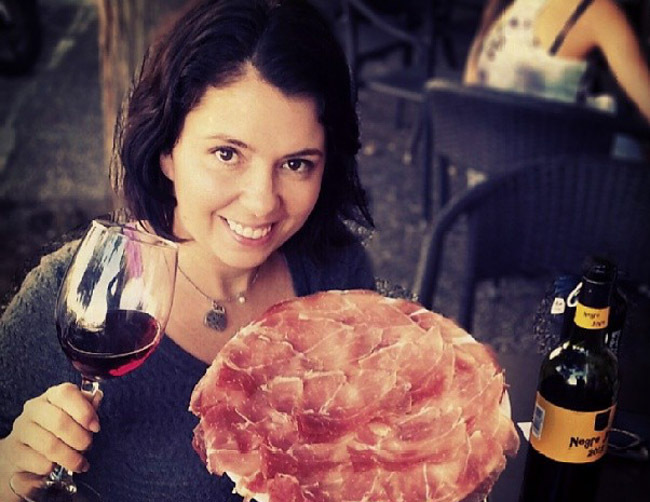 Traditional pesto recipes are a basic mix of basil, garlic, pine nuts, olive oil and parmesan. The name “pesto” is a generic term. Just like salsa (sauce) and curry (spice blend) and comes from the Italian verb pestâ, which means to crush. Traditionally pesto is made with a mortar and pestle in a circular motion. It can be an intense preparation that I attempted once by hand but now I just make it in a food processor. It’s not a sauce limited to Italy, in Argentina there is chimichurri and in France you can find pistou which is from Provence and includes only basil, olive oil and garlic. Pesto took North America by storm in the 1980s and 90s when we were eating it on everything from pasta to rice. And when people grew tired of basil pesto sun-dried tomato pesto became the hot new ingredient. I’m sure Italians across the pond were gagging with distaste when they learned of this. But pesto is a really versatile sauce, you can substitute for whatever nuts you have on hand and most hard cheeses like pecorino or aged cheddar. Vegans need not fear that they’ll miss out on the pesto train as they can substitute nutritional yeast for the cheese. 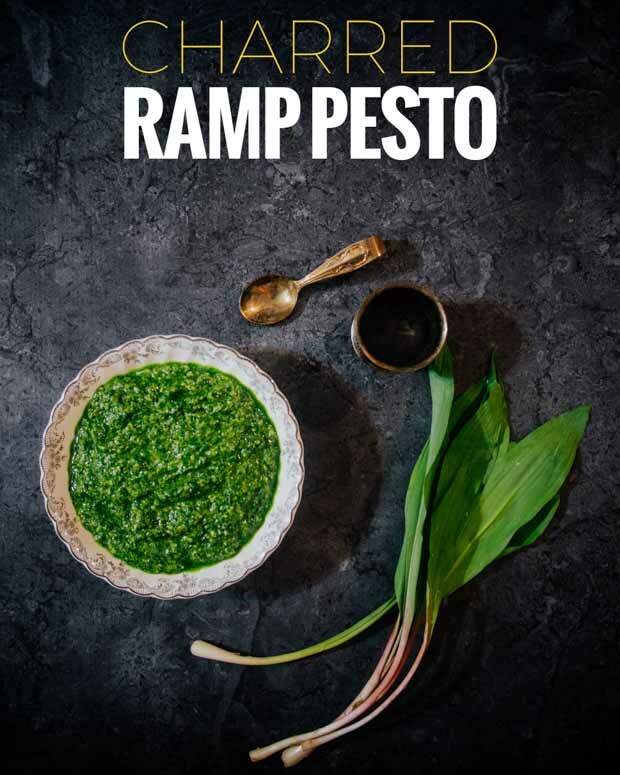 This charred ramp pesto recipe excludes garlic, which is traditionally in pesto, as the ramps have such a great flavour. Charring the ramp leaves brings out the intensity in flavour. Don’t be afraid of using a kitchen blow torch. Although they were once only in chef’s kitchens they are now mainstream. This one is only $20 and is perfect of first-timers. With any recipe that only includes a few ingredients you must ensure to use quality products. This is not the time to bust out your iodized salt – instead use good sea salt. I love this light grey sea salt for everyday use, I put it on everything. The same is true for the olive oil. The recipe calls for nearly one cup olive oil so use the best you have as it makes all the difference in the final product. 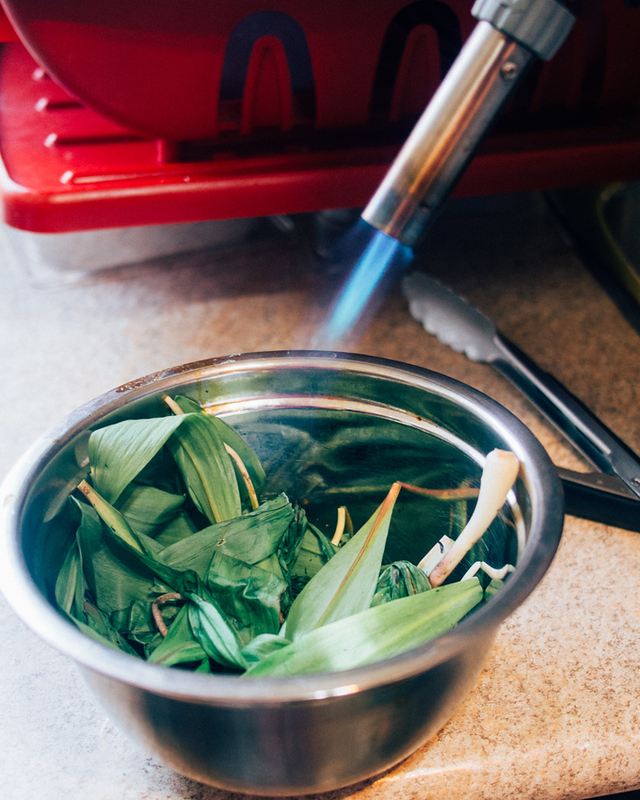 Char the ramps on an open flame, either on a gas stove, barbecue or with a blowtorch. 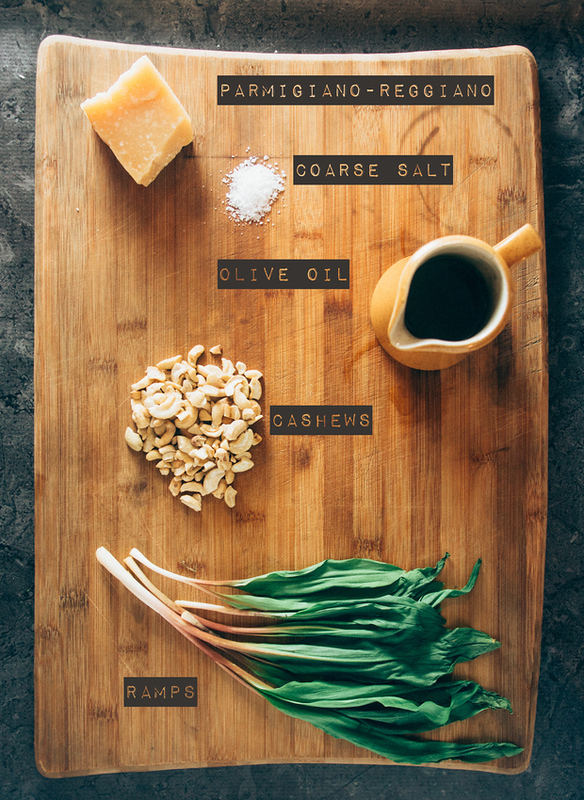 Combine ramps, cashews, parmesan in a food processor and pulse to coarsely chop. Stream olive oil into food processor until smooth. If you make a lot of pesto and want to freeze some of it simply top a freezer-safe container with a layer of olive oil. Unlike canola oil or grapeseed oil, olive oil isn’t a winterized oil, which means it will congeal in the fridge or freezer. While this may seem like a negative aspect in most cases, olive oil is perfect for preserving foods in the freezer. The congealed oil creates an air-tight surface and protect the charred ramp pesto in the freezer. Wow,very interesting post.Thanks for this sharing post. its a guide to my new recipe. I Actually a traveler that ALWAYS attracted in food.. LMAO anyway You got my attention. seriously its look delicious I love it , and i also a food explorer. that’s why another reason why i go travel 🙂 . I hope more Food post on this blog 😉 just kidding 😀 i’ll keep in touch just keep it great..
oops, great recipe. Thank you for sharing! It’s true, in Italy the one and only pesto is made with basil, and it might or might have not garlic. But I’m Italian and yet I love experimenting with different greens and nuts. I don’t even know if I ever had ramps, but love the look of them, and you say their taste is great. So I’ll see if we can find some and try making this pesto! I love this – such a fresh, flavourful pesto using the ramps you foraged. I am just dying to learn more about foraging and get started myself. I just read your guide (thank you!) and will look into the Peterson Field Guide. I’m a big fan of pesto and love how you can change it so dramatically just by using different nuts and in this case, a substituting basil! I love making pesto with all kinds of ingredients and this one looks very intriguing. 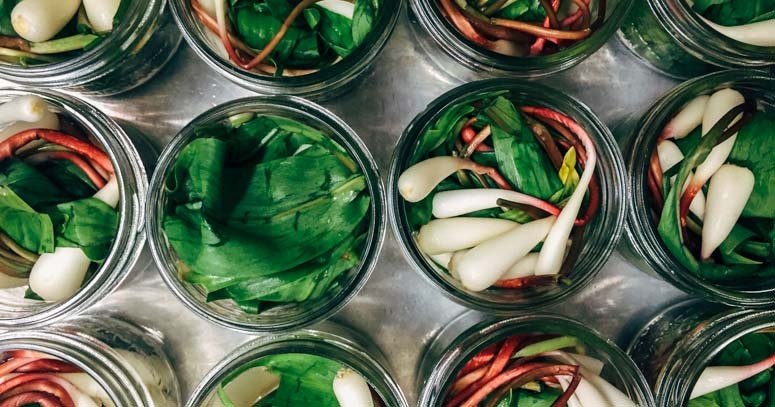 You’re so fortunate to be able to forage for ramps. I don’t think they grow here in BC. I need to find myself some ramps and I am in definite need for a blow torch now. I love the photographs on your blog as well as this amazing pesto recipe. Everyone in my family loves pesto and I’m sure my son eats it out of the jar sometimes. I am not sure where to find ramps from as yet, but I’m going to look for them. Thankyou!